MAD TRIBE is a collaboration between SPACE TRIBE & MAD MAXX (Olli Wisdom & Max Petersen). They are both well established artists on the Psytrance scene for many years & play festivals & parties all over the world. They met in San Francisco at one of the infamous CCC parties & became good friends. They started making music together in 2005 clicking immediately with a shared vision for a full power psychedelic sound with twisted sense of humour. 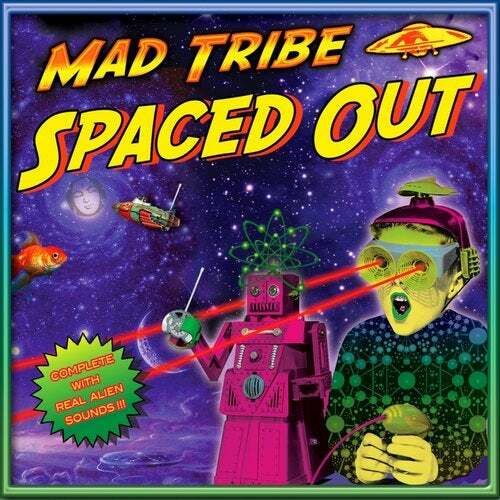 MAD TRIBE will release their stunning first album SPACED OUT on TIP records in October, Bringing a Juicy Full Power Psychedelic Experience, guaranteed to spark all 6 senses. Jon Klein (Specimen, Siouxsie & the Banshees, Sinead OConnor) has also been bringing his sublime guitar skills to the Mad Tribe studio sessions. Tracks such as Peak Experience, Time Warp & Electro Convulsive Therapy have been electrifying dance floors everywhere. Max Peterson has been performing and releasing his unique brand of trance music under various project names since 1998 including seminal San Francisco trance project BIODEGRADABLE & SIRIUS ISNESS. In 2007 he started his solo project MAD MAXX perfecting a unique sound, embodying all the travels, experiences and parties. Olli Wisdom is the man behind the psychedelic phenomenon that is Space Tribe. Olli has been a pioneer of Psychedelic Trance for many years & Space Tribe is one of the most well known names in the psychedelic scene. In 1993, Olli, his brother Miki, and fellow space cadet, Richmond, started Space Tribe clothing in Bali. The fractal fluoro party gear was an instant success, and now you can see it at parties all over the planet. Space Tribe released the first album, 'Sonic Mandala' in 1996, and since then Space Tribe has released at least an album a year.